The price of gold jumped 2.3% on Friday, its biggest one-day gain since January. Gold closed the week up 2.8%. Investors typically buy gold when they sense financial danger. That’s because gold has preserved wealth through economic depressions, stock market crashes, and every kind of crisis imaginable. It’s the ultimate form of wealth insurance. Last week, the danger was in the stock market. U.S. stocks had their most volatile week in over three months. The S&P 500 fluctuated at least 1% four out of five days, which hasn’t happened since the S&P lost 11% in 6 days in late August. Ultimately, the S&P 500 ended the week flat. The current bull market in U.S. stocks is almost seven years old. From March 2009 through December 2014, the S&P 500 gained 204%. However, the rally has petered out this year. The S&P 500 is up just 2% in 2015. Market Vectors Gold Miners ETF (GDX), which tracks the performance of major gold miners, gained 5.3% on Friday. It was GDX’s largest one-day gain since October 2014. For the week, GDX climbed 11%, its largest weekly gain in almost four months. Gold miners are leveraged to the price of gold. When the price of gold jumps, large gold stocks can jump two to three times as much, and sometimes more. A small increase in the price of gold can make for a big gain in gold stocks. The U.S. economy created 211,000 new jobs in November. That’s 11,000 more jobs than economists had expected. The U.S. unemployment rate stayed at 5%, a seven-year low. This was the second strong jobs report in a row. In October, the U.S. economy created 118,000 more jobs than economists had expected. And wages grew at their fastest pace since 2009. The Fed hasn’t raised its key interest rate since 2006. It cut rates to effectively zero in 2008 to fight the financial crisis, and it hasn’t raised rates since. For example, U.S. stock prices are near record highs. The popular CAPE ratio says U.S. stocks are 58% more expensive than their historic average. Commercial property prices are also at record highs. Commercial real estate prices are now 14.5% above their 2007 highs, according to research firm Real Capital Analytics. On December 16th, the Fed is widely expected to raise rates for the first time since 2008. The Fed has held off on raising rates for years because of the weak economy. But the recent strong jobs data gives the Fed the green light to raise rates. When the Fed raises its key interest rate, bonds and dividend-paying stocks typically pay higher rates as well. Because gold doesn’t pay income, higher rates increase the “opportunity cost” of owning gold. Conventional wisdom says that higher rates are bad for gold. In July, HSBC’s Global Research team published research showing that the price of gold has increased after the last four Fed rate hikes. History shows that gold prices also fall leading into a rate hike and generally rise, though sometimes with a lag, after the first rate hike… Investors are apt to unload gold in anticipation of tightening monetary policies. This negative pressure is sustained until the Fed announces a rate hike, which then eases the negative sentiment towards the yellow-metal. This explains the subsequent rallies in gold that occurred shortly after the Fed announced the first rate hike in the last four tightening cycles. 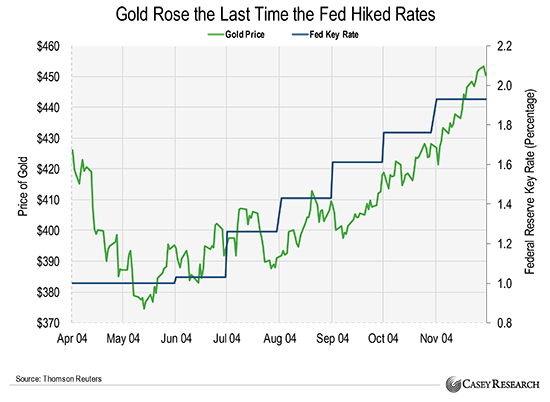 The chart below shows gold going up after the Fed started raising rates in 2004. The price of oil has crashed 65% since last summer. It’s now trading at a six-year low of $37.65/bbl, thanks to a massive global surplus of oil. At the end of September, the oil stockpiles of developed countries hit an all-time high of almost 3 billion barrels, according to the International Energy Agency. And in March, U.S. production reached its highest monthly level since 1972. Despite plunging prices, U.S. oil output has only declined 5% over the past seven months. Can you legally remove yourself from U.S. tax code? OPEC is a cartel of 12 oil-producing countries. It accounts for 40% of the world’s annual oil production. Since 1982, OPEC has set oil production limits to help manage supply and stabilize prices. Since 2011, OPEC has had a 30-million barrels per day (bpd) production limit. However, the members of OPEC have ignored that limit for the past 18 months. In July, OPEC’s output reached 31.88 million bpd. Reuters reports that this was OPEC’s highest production level since it started keeping track in 1997. Last month, OPEC produced 31.77 million bpd. Yet OPEC is still producing near record-high levels. That’s because these countries don’t have much choice. Without oil revenues, their economies would starve. Crude oil makes up 83% of Saudi Arabian exports. It accounts for 68% of Iran’s exports. It accounts for 47% of the UAE’s exports. This explains why OPEC isn’t acting like a cartel. It’s every member for itself right now. The price of oil dropped 2%, to $40.14, on the news. SPDR S&P Oil & Gas Exploration & Production ETF (XOP), which tracks large U.S. oil producers, also fell 2.7% on Friday. It was down another 4% today in early morning trading. XOP has now dropped 58% since oil peaked last summer. Weak oil prices have also fueled a selloff in oil services companies, which sell “picks and shovels” to the oil industry. The Market Vectors Oil Services ETF (OIH), which holds 26 oil services companies, has lost 48% since oil peaked last summer. As long as OPEC continues to flood the market, the stock prices of oil producers and oil services companies will be under pressure. However, the world still needs oil. At some point, we’ll get an opportunity to make a lot of money buying beaten-down oil stocks. We’ll alert you when that time comes. Today’s chart compares GDX to the S&P 500. As we mentioned earlier, GDX is an ETF that tracks major gold miners. It gained 10% last week. This was GDX’s best week in almost four months. Still, it’s too early to tell if this was short-term rally or the start of something bigger. 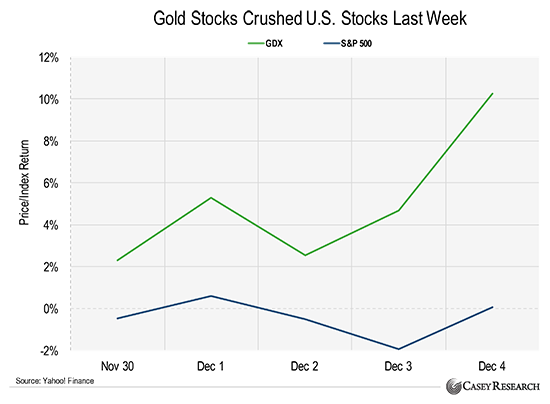 We think gold miners offer much more upside than most U.S. stocks right now. As we noted earlier, the U.S. stock market is in one of its longest bull markets in history. The current bull market is 81 months old. That’s 31 months longer than the average bull market since World War II. Meanwhile, gold stocks have been in a bear market since September 2011. GDX has declined 78% since then. Gold mining stocks are cyclical. They go through big booms and big busts. When gold stocks enter their next bull market, the gains could be huge. During the last gold bull market from 2008 to 2011, gold miners skyrocketed 309%.